Mr. Coffey is a former U.S. Attorney, Southern District of Florida (1993-1996); and served as Chair, Southern District Conference, Florida Federal Judicial Nominating Commission (April 2009 – January 2017). He is annually recognized as one of Florida Trend’s Legal Elite, Florida “Super Lawyer,” and South Florida Legal Guide’s “Top Lawyers”, recognized by the National Law Journal as one of its Lawyers of the Year for 2000, as Member of Gore Legal Team. He concentrates on complex litigation at trial and appellate levels, in state and federal court. A frequent teacher and guest lecturer, he has been Guest Legal Analyst providing legal commentary for international networks: CNN International, Telemundo, Univision, Canadian Broadcasting Company; national networks: CNBC, CNN, CNN Headline News, FOX, MSNBC and NBC; and local television: ABC-10, CBS-4, América TeVe, Telemundo-51, Univision-23, TeleMiami. As a teacher, Mr. Coffey is adjunct faculty member for University of Miami School of Law, Florida Constitutional Law (2008 – present), Florida International University (Administrative Law 2011), and Trial Advocacy Program (1991 – 1993); and a Lecturer in trial skills and substantive law for The Florida Bar, The Academy of Florida Trial Lawyers, Dade County Bar Association, University of Miami School of Law, Professional Education Systems, Inc., National Business Institute, Inc. and CLE International, Inc.
Named 2019 Best Lawyers Lawyer of the Year for Professional Malpractice Law Defense. 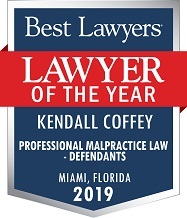 Annually recognized as one of Florida Trend’s Legal Elite, Florida “Super Lawyer,” and South Florida Legal Guide’s “Top Lawyers”, recognized by the National Law Journal as one of its Lawyers of the Year for 2000, as Member of Gore Legal Team.